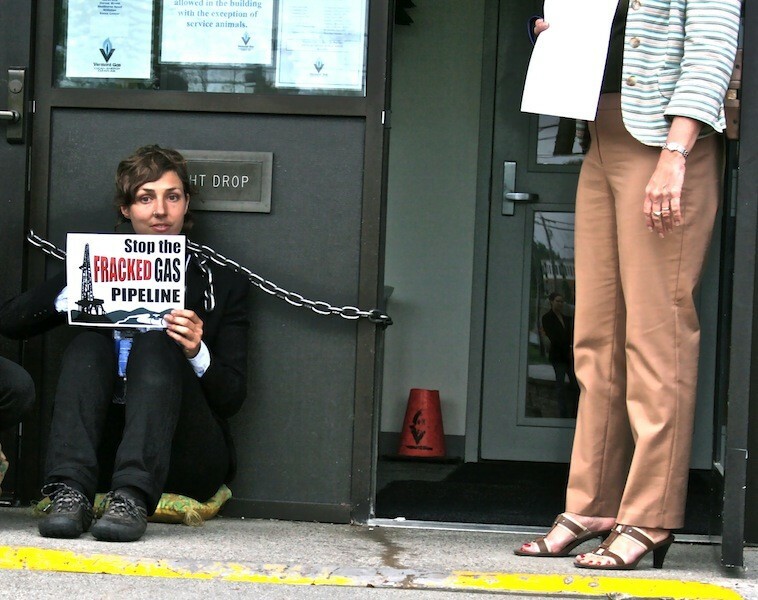 At 8 a.m. this morning, 31-year-old Sara Mehalick sat down in front of the main entrance to the Vermont Gas headquarters in South Burlington and chained herself to the building. There she planned to remain, she said, until Vermont Gas called off its plans for the construction of a new natural gas pipeline to Addison County. More than four hours later, with protesters looking on from the sidewalk, Mehalick was arrested for refusing to leave the private property and was led away. Mehalick and the grassroots environmental group Rising Tide Vermont said the action was one of nonviolent civil disobedience. Vermont Gas took a different view. "We respect peoples’ need and their rights to protest and voice their opinions," said spokesman Steve Wark in a phone interview with Seven Days. "However, today’s behavior crossed the line," he continued. In a news release issued this afternoon, Wark said that an administrative support staff member was assaulted while attempting "to ensure the protest did not impede the normal flow of customers" into and out of the building. 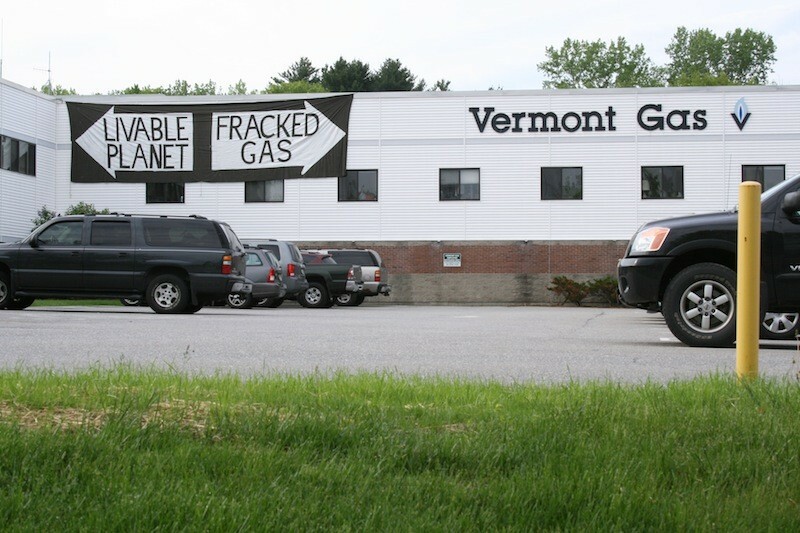 "Protestors made physical contact with the Vermont Gas employee – with their hands and the chain – and physically, and visibly, injured the employee on the arm," Wark wrote. Rising Tide organizer Keith Brunner said that he wasn't present when the alleged assault took place, but that Rising Tide is "committed to nonviolent civil disobedience. That's what this was today." 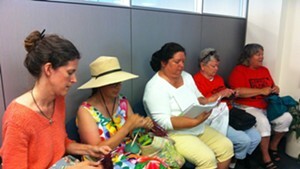 "I’m really here defending a livable planet," said Mehalick by telephone, prior to her arrest. At the time, she sat on a small cushion and wore a U-shaped bicycle lock around her neck through which the chain blockading the door was threaded. Does today's action represent an escalation in the fight against the Vermont Gas pipeline, slated to carry natural gas from Chittenden County south to Middlebury and potentially beyond? "Definitely," said Brunner. "I don’t think it’s going to stop here. We’re saying, we’re not going to stop until you stop. People are pretty serious. The stakes are way too high with climate change and fossil fuels." Frustration has been mounting among activists and property owners along the route of the Vermont Gas pipeline. The first phase, which will carry gas to Middlebury, won approval from the Public Service Board in December; the PSB is currently weighing the "public good" of the second, which would ferry fuel to Ticonderoga, N.Y. Vermont Gas contends that natural gas is a cleaner burning fuel that will cut emissions, and save businesses and homeowners millions on heating costs. Opponents counter that many of the small towns through which the pipeline will pass will benefit little, if at all, from the transmission line. Distribution would be limited in most communities to town and village centers. And increasingly, arguments have turned to the environmental impact of the project. Smaller grassroots organizations like Rising Tide are joined by bigger orgs such as the Vermont Public Interest Research Group and the Conservation Law Foundation; together, environmentalists argue against investing in fossil fuel infrastructure instead of renewable energy projects. Road signs in Addison County urge passers by, "Stop the fracked gas pipeline," a reference to the method — hydraulic fracturing — used to extract a portion of the natural gas Vermont Gas peddles. Vermont became the first state in the country to ban fracking when it did so in 2012. And though environmental concerns were aired at length at a recent PSB public hearing on Phase II of the pipeline project, activists say that the PSB process doesn't allow for the kind of big picture complaints they bring to the table. "We need to find other ways of preventing these projects from happening because the state process is really weighted so heavily in [corporations'] favor," said Brunner. 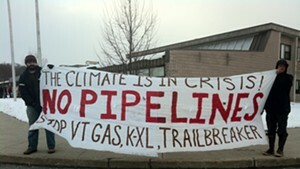 Mehalick has spent the last year and a half fighting Vermont Gas's pipeline plans with Rising Tide Vermont. She said the decision to risk arrest wasn't a difficult one, and that she felt strong "standing on the shoulders" of those who'd practiced civil disobedience in the past. "I feel really committed to stopping this fracked gas pipeline," she said. "We’re really here to tell Vermont Gas that they need to stop all of their construction plans and withdraw all of their permit applications." 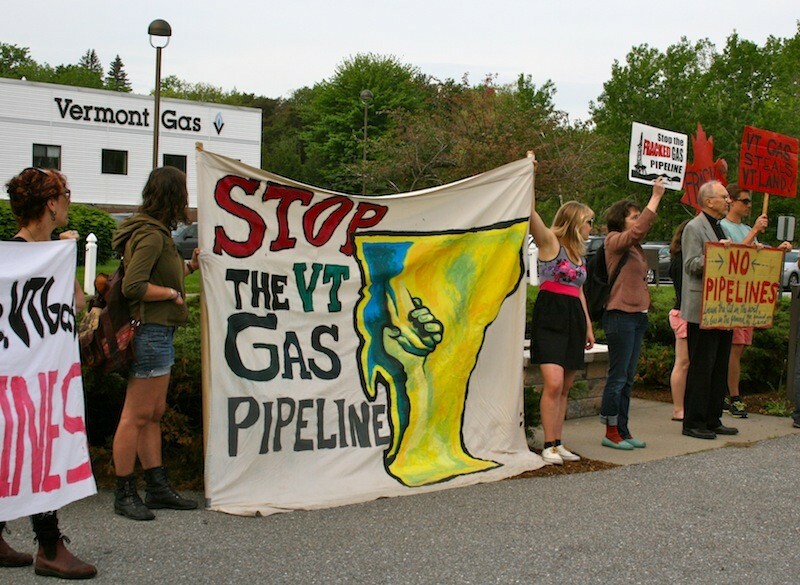 By late on Tuesday morning, most of the Rising Tide protesters had decamped from Vermont Gas private property to a nearby sidewalk, leaving Mehalick and a small crew of supporters at the front door. Vermont Gas employees were using other entrances to the building to come and go. Asked how long she expected to be chained to the front door, Mehalick said she wasn't thinking about timelines and was just focused on "getting our message out and talking to people about climate change." Police looked on, and during a conversation by phone with Brunner, he related that more police cars were arriving. 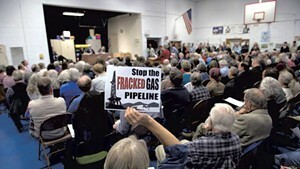 Vermont Gas may need to brace for more protests like this one, moving forward. Rising Tide is hosting a four-day camp in Charlotte in early June to educate more activists in "direct action." Among the workshops on tap: "Putting Our Bodies on the Line: Intro to Blockade Tactics."